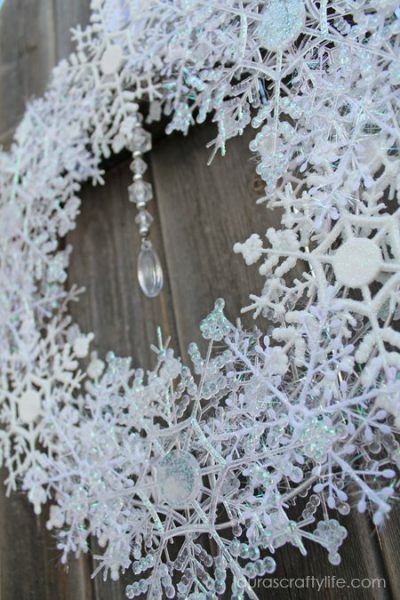 Snowflake Wreath. 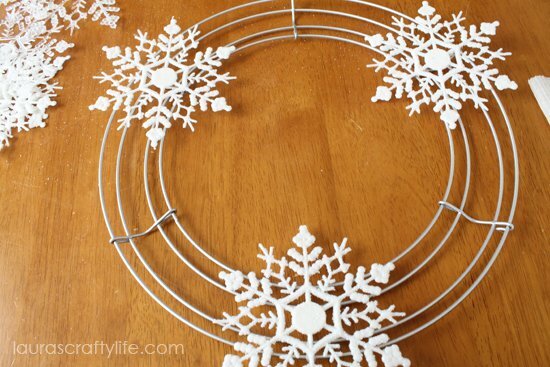 Create a beautiful snowflake wreath to display all winter long using supplies from Dollar Tree in less than 15 minutes. I wanted to create a home decor piece I could use for decorating as early as November, but be able to leave up until February! 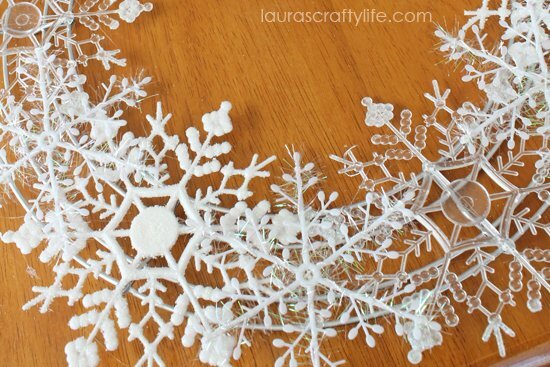 I created a snowflake wreath with just a few supplies. And shhh, don’t tell – but, this might have taken me even less than 10 minutes to put together. Spray paint your wreath form. 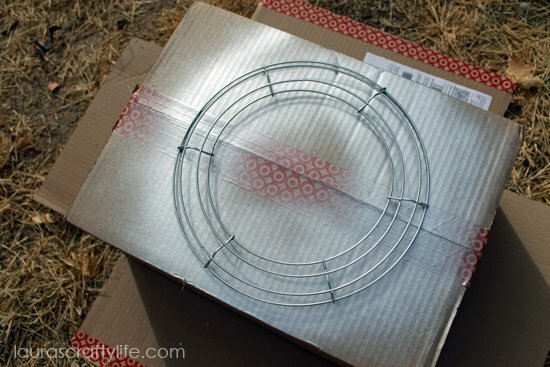 I purchased my wreath frame for under $3.00 at Jo Ann’s. Skip the shipping! Buy online & pick up in-store at JOANN! I painted mine with Krylon Colormaster Metallic in silver. Note: I can’t find this exact paint anymore, but the brushed metallic paint in nickel is very similar. I painted only one quick light coat. Since I was going to be covering the wreath with the snowflakes, I wasn’t worried about coverage. Although the one coat actually covered really well! I love Krylon paint. Be sure to paint both the front and the back of the wreath. Allow the wreath to dry. 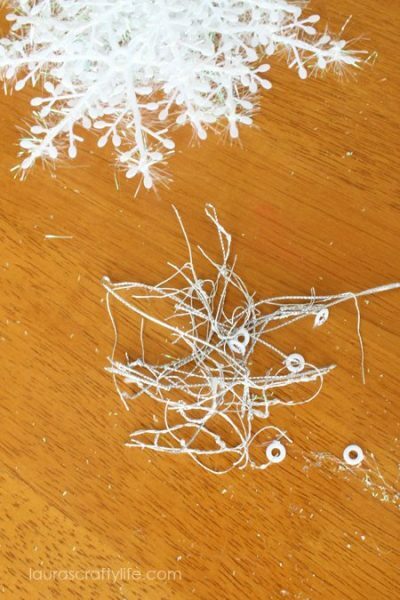 I purchased four packages of snowflakes from Dollar Tree in various sizes (21 total snowflakes). Take your snowflakes out of the packages and cut off all of the tabs and ornament strings. 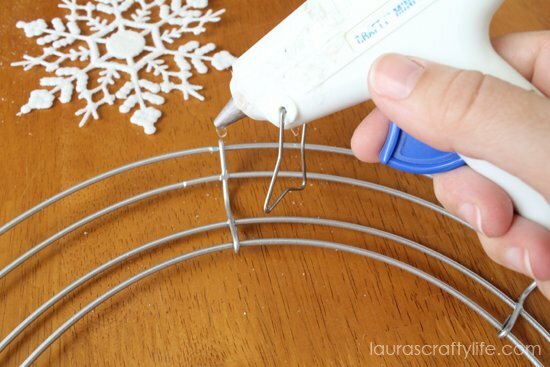 Begin gluing your snowflakes onto your wreath frame. 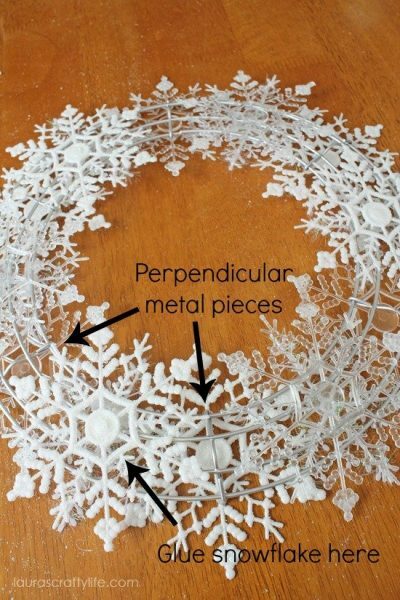 I used a spot of glue at the top and bottom of the perpendicular metal pieces on the wreath frame. 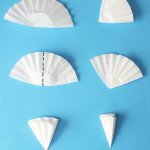 Helpful tip: Do not use a low temp glue gun for this project. 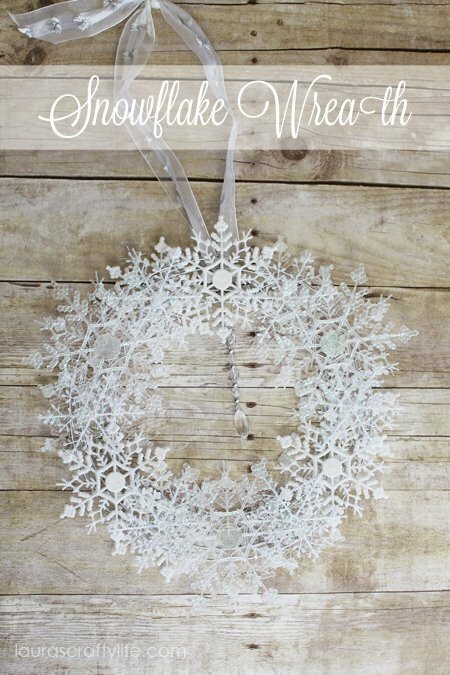 I originally did mine with a low temp instead of high temp glue gun and all the snowflakes started to pop off by the time I made it around the whole wreath! I chose to do mine in a pattern, but you could also just randomly glue the snowflakes to the frame. 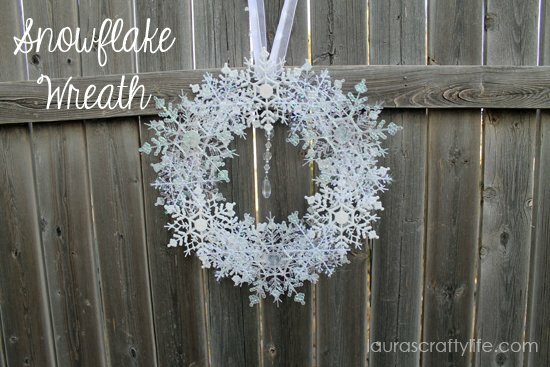 Start with three white glittered snowflakes evenly spaced around the wreath frame. 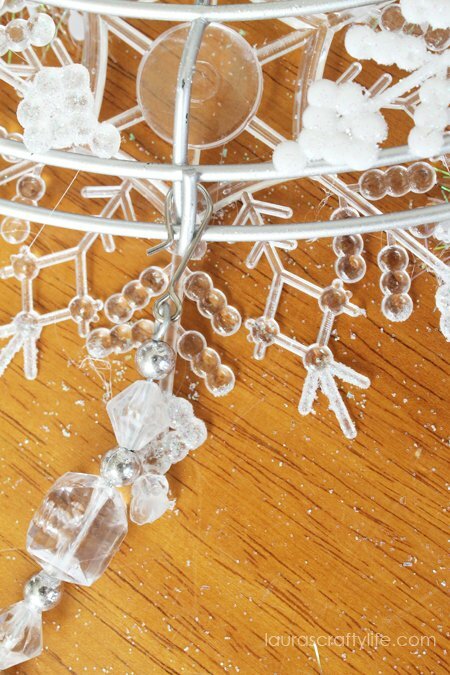 Then add the clear snowflakes using the wires as a guide for spacing. I added in the six white and tinsel snowflakes into the spaces between each of the snowflakes that were already glued down. 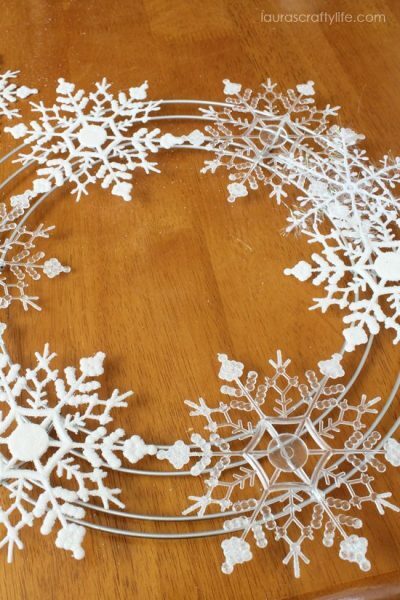 Then, I flipped the wreath over and glued the remaining six snowflakes to the back, evenly spacing them around the edge. This time, I used the spaces between each perpendicular metal piece. This will make the wreath look full when it is finished. Lastly, I thought the clear snowflakes could use a little something extra. For the three clear ornaments showing on the front, I glued a large glittered snowflake to the middle of each clear snowflake. 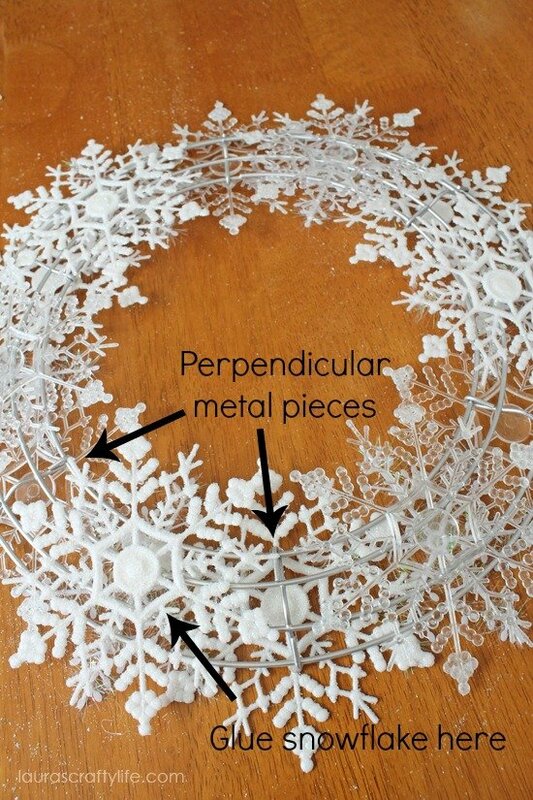 Add hot glue to the large clear circle and place the other larger, glittery snowflake directly on top. 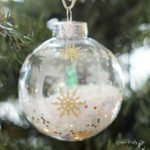 I found these really pretty hanging beaded ornaments at Dollar Tree, as well. Hook one around the wire wreath frame towards the top. 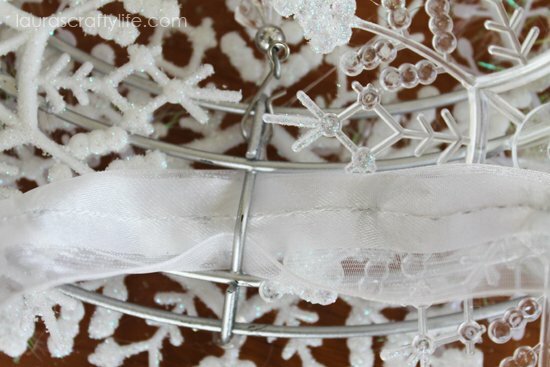 Loop ribbon through the wreath frame. Tie in a knot or bow to use as a hanger for your wreath. Note: This last step is optional. 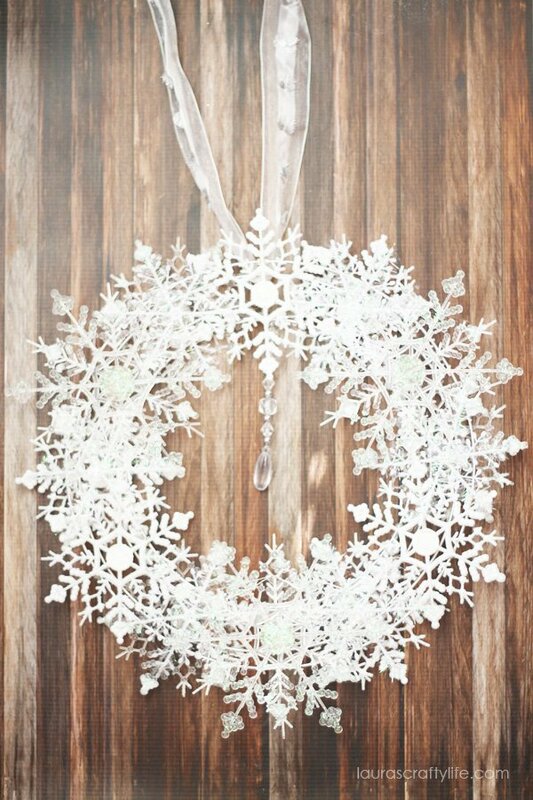 You could easily use a wreath door hanger to hang your wreath without the ribbon. This project comes together really quickly once the frame is spray painted. Even better, the total cost of the project (minus the spray paint and ribbon I had on hand) was only $8.00! 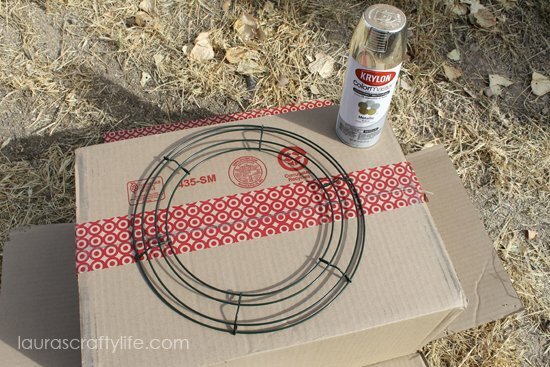 However, if you needed to purchase spray paint and ribbon you could still complete this project for under $15.00. 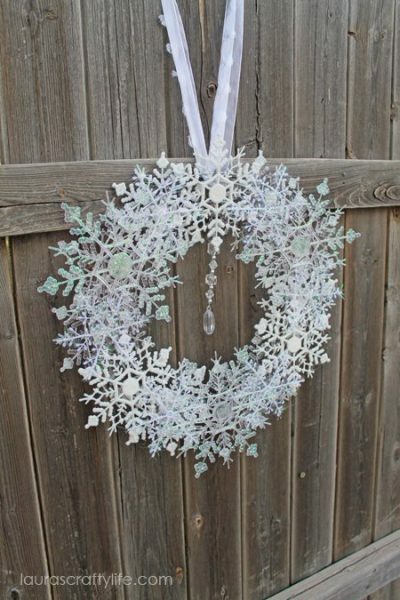 This wreath is part of the Craft Lightning Series hosted by Angie at the Country Chic Cottage and Carolina at 30 Minute Crafts. 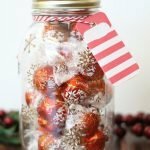 A group of bloggers get together and share quick, easy crafts that take 15 minutes or less to complete. 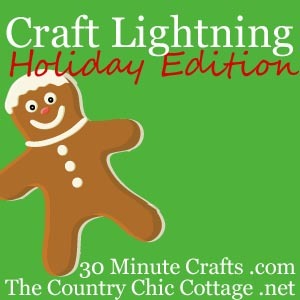 Check in on both blogs this week to see all the fun holiday projects being shared! Lovely wreath Laura! Thanks for participating! Love this! I love that you used a crystal ornament to hang it. SO very, very clever! Thanks so much for sharing! Pinning! Love this so much , I am in the process of making it . Simply elegant . Thanks for sharing . I am so glad. Be sure to share a picture when you are done. You can email me or share it on social media!